It was in early 2001 that I left my life in the Australian suburbs behind me to live in Israel for one year. At the time, I was in between a lot of things. But mostly between closing my business and planning to open a new one. In a fortunate series of events, my wife had accepted an assignment to work in Israel, and with me having time on my hands, it was perfect timing for me to join her. I could spend the best part of a year planning my new business, writing, playing my guitar or more than likely, generally taking it easy for a while. My knowledge and understanding of Israel, Palestine and the conflict was minimal. Like many, what little I knew came from reading the news or watching television. But I had been told that there was good food, lovely beaches and a warm climate there, so that was all I needed to know to be reassured as I boarded my flight in Melbourne. When my flight landed at Ben Gurion Airport in Tel Aviv in the early afternoon, it was warm and sunny. A perfect way to start my one-year semi-vacation. When I started down from the plane to the tarmac, I had only made two steps when I noticed two men in dark suits striding up. They were forcing their way past the line of descending passengers in front of me. As they stepped up briskly, I noticed that they were both wearing earpieces and sunglasses, so they were security officers of some kind. I looked behind to see what might be going on. As I turned my head back, the two men were in front of me. “Come with us, please”, one of them said, firmly, as they took me by the arms to descend the remaining steps. A two-hour interrogation was my welcome to warm, sunny Israel. When I finally collected my luggage and left the arrival hall, I looked around for my wife. In the thinning crowd, I spotted a man holding a small sign with my name on it. I walked towards him. “Mr Haines?”, he asked. I nodded. He was my driver and had been assigned to drive me to Jerusalem. As we walked to the car, he explained that my wife had gone to Gaza early that morning, but was having trouble leaving due to a naval and air bombardment of the Gaza Strip. I didn’t say a lot as we sped along the Tel Aviv–Jerusalem Highway. But he chatted and told me about a recent spate of suicide bombings in the centre of Jerusalem and that I should take a little care when walking around. There were a lot of new checkpoints due to the uprising, so I should always have my papers with me. He told me a little about the wonders of The Old City, but that I should be on the lookout for pickpockets around the gates. Only twenty-four hours before, the most crucial event in my life was if my football team had won or lost on the weekend. But in those first three hours so much had changed. I had been questioned by Mossad, I think, but they didn’t introduce themselves, so I can’t be sure. I was going to have to think about bombings, pickpockets and wondering if my wife was alive or not. I was extremely relieved when my wife arrived safely at her office after I had spent an hour or so talking with some of the staff. The sun was setting as we left the office for dinner at the famous American Colony Hotel. Finally, I began to relax, just a little. Two glasses of wine helped, but then jetlag started to set in. As with all plans, there are always a few glitches. For us, it was that our house wasn’t ready. There had been a delay, so it meant that we would be staying in a spare room with a couple of my wife’s colleagues for a few days. After more than a few days, I recalled Douglas Adams saying that time was an illusion. In our case, what was meant by a few days was perhaps a little illusionary. But finally, after quite a delay, we moved into our lovely new home in Sheikh Jarrah, a predominantly Palestinian neighbourhood in East Jerusalem. Within a few days, we felt quite settled, and I could finally look forward to my relaxing year in Jerusalem. After being a tourist for a couple of weeks, and managing to learn how to ward off the pickpockets at The Old City gates, I knew that I had so much to learn about Jerusalem, the people, and the conflict. Living meant learning if I was to settle. My knowledge about the Middle East from newspapers and television back home was utterly worthless at best, and a wealth of lies or propaganda at worst. When I asked a few people, two gave me the same piece of advice. Start by reading O Jerusalem! by Larry Collins and Dominique Lapierre. 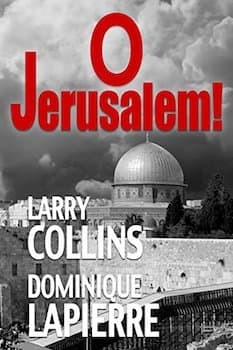 We lived in Sheikh Jarrah in East Jerusalem, and after reading only the first few chapters, I realised that our street was an important route in the history of the war of independence following the end of the British mandate. As I read more, sitting in the middle of the context and having seen some of the places mentioned in the book, it helped me to visualise some of the subject matter and events of the time in 1948. I had already completed a fair tourist’s traipse around the city. So I had seen The Old City, the Church of the Holy Sepulchre, the Al Aqsa Mosque, the Western Wall, Jaffa Gate and I had even made a few new friends, both Arab and Jew. There was no better place than my new home in the city of Jerusalem to take my well overdue history lesson about the creation of the state of Israel and what it meant to the Jewish and Palestinian residents living around me. The checkpoints never got any easier. I learned to keep my hands out of my pockets and never carry a bag or backpack. Approaching a checkpoint meant I needed to have my papers ready in one hand, and some good luck in the other. Very often, the soldiers were teenagers, more nervous than me. Who could blame them? The time of the second intifada was dangerous for everyone. One morning, when I headed off for a visit to the city centre in West Jerusalem to meet a friend for coffee, across the invisible “Green Line”, I was stopped as usual at a checkpoint. As the young soldier checked my papers, the wretched sound of a suicide bomber exploded from where I was headed. The soldier told me to go home. It didn’t take much effort on my part to do as he advised. I went back to the last chapters of O Jerusalem! I learned that the birth of Israel began with ships that were ladened with armaments and planes and sat anchored at sea in the Mediterranean as David Ben Gurion waited for the United States to recognise the new state. Weapons of the like that were on these ships could only be delivered to a recognised state, and until David Ben Gurion could gain that recognition, the ships had to wait. To resolve the impasse, the United States signed their recognition of the new state but it did not mention the name of the new state in the document, because it was yet to be named by a government that had not yet been legally formed. As I was learning quickly, nothing was unusual in the history of my new home for a year. My year in Jerusalem didn’t bring me all the answers. But with the help of reading, learning, listening and understanding I grew in my ability to see Jerusalem, Israel, Palestine and the long conflict in a new light. My light. In Sheikh Jarrah, down the road from where we lived, in Nashashibi Street, there was a house that was partly occupied by settlers, while the Palestinian family that has been living there for several generations was forced to move out. This was one of the first houses in the neighbourhood claimed by the settlers. Since then, many Palestinian families have been evicted. Civil society organisations, such as Peace Now have tried to defend the rights of Palestinians in East Jerusalem, but sadly evictions have only intensified. The neighbourhood is fast losing all of its Palestinian population. If you want to learn more about what is going on in the district, you can watch this poignant documentary by Just Vision. The following is a trailer, but you can watch the full version of the movie here. Just Vision is an organisation that is trying to increase the power and reach of Palestinians and Israelis working to end the occupation and build a future of freedom, dignity and equality for all. If you travel to Jerusalem, a visit to Sheikh Jarrah will give you a sense of how life is changing in this part of the city. You might find, as I did, that the everyday reality of people is not at all like the one that had been created by biased news coverage and misinformation. History was one thing for me, but the reality of people I met was another. I learned that truth lies in the eyes and words of the people you meet and that you then must interpret and understand their version of the truth. It was not an easy thing to learn how to do for a naive Australian, but I tried, and I think somewhat succeeded.